Registered in The Chinese Armorial, October 25, 2011. Arms: Barry Or and Vert on a bend Vert three footballs Or. Crest: Issuant from a coronet Argent the upper rim set with flames proper, a demi-horse Argent winged Or holding a wild rose proper. Supporters: Two Lim dragons (i.e., a Chinese dragon with the hindquarters of an Albertosaurus) per fess Or and Vert standing on a compartment tapissé of wheat Or set with wild roses proper. Grant: Canadian Heraldic Authority, The Public Register of Arms, Flags and Badges of Canada, Volume V, p. 119, March 15, 2007. Norman ("Normie") Kwong had a distinguished career in professional sports before entering realty and politics. He was the first Chinese Canadian to play professional football in Canada (i.e., American football, not soccer), first with the Calgary Stampeders (1948-1950), and then with the Edmonton Eskimos (1951-1960). He acquired the nickname "the China Clipper" and won the Grey Cup four times. He was chosen as Canada's Outstanding Male Athlete of the Year in 1955 and inducted into the Canadian Football Hall of Fame in 1969 and the Canadian Sports Hall of Fame in 1975. He was also president and general manager of the Calgary Stampeders from 1988 to 1991 and a part owner of the Calgary Flames hockey team from 1980 to 1994. When the Calgary Flames won the Stanley Cup in 1989, he became only person to have won both the Grey Cup and the Stanley Cup. He served as Lieutenant Governor of Alberta from 2005 to 2010. The shield represents a Canadian football field viewed from above with the 10 yard lines defined by the bands of green and gold. The colours are the team colours of the Edmonton Eskimos, the Canadian Football League team for which Kwong played and starred. The green band symbolizes a swift path across the field, while the three gold footballs refer to the speed of his advancing the play. The white horse is a reference to the Calgary Stampeders, Kwong's first football team. The wings refer to his nickname, “the China Clipper”, derived from the airplane of the same name. The rose refers to his wife Mary Kwong, a gardener. The coronet with red flames symbolizes Kwong's involvement with, and ownership of, the Calgary Flames, whose team colours are red and white. 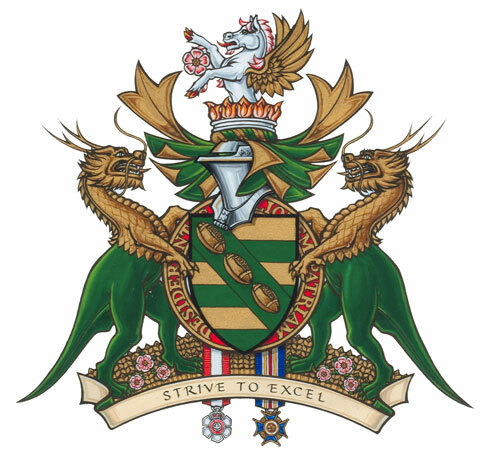 The Canadian Heraldic Authority created a new heraldic beast called the "Lim dragon" as supporters for Kwong. The Lim dragon has the upper part of a Chinese dragon and the lower part of the Albertosaurus, a dinosaur named for the province, which is plentiful in dinosaur fossils. The grain fields represent the wheat grown in Alberta. The wild rose is the provincial flower. The illustration shows the decorations of the Member of the Order of Canada and the Alberta Order of Excellence suspended from the shield. * Norman Lim Kwong died on September 3, 2016.